In Parashas Vayikra, the Torah teaches that if a man who was tamei, impure, walked into the Beis HaMikdash, he was required to bring a korban to atone. The Gemara emphasizes that he needed atonement whether he walked into the Mikdash and didn’t realize that he was impure, or whether he knew he was impure but didn’t realize that he had walked into the Mikdash. Rav Yaakov Galinsky, zt”l, asked a question about this: The Gemara is talking about the Beis HaMikdash in all its glory—the kohanim serving, the Levites singing. Could it possibly be that a person entered the Mikdash and didn’t realize it? It’s hard to believe, but yes. 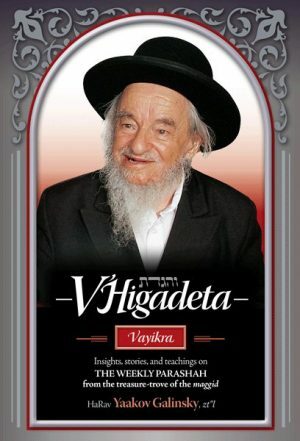 Think about it: How many times does a person forget whether he said Birkas HaMazon after he ate, or whether or not he recited Ya’aleh V’Yavo in Shemoneh Esrei? When a person lacks awareness, he makes mistakes and loses his focus. He could even forget that he’s standing in the very Courtyard of the Beis HaMikdash! In delivering his derashos, Rav Galinsky’s aim was to inspire, to awaken, to make people aware. To give meaning and focus to the tefillos we pray, the Torah we learn, the mitzvos we do. And he did it with a smile and a well-placed joke, a captivating story, and a riveting devar Torah. Rav Galinsky delivered thousands of derashos in the halls of yeshivos and batei midrash, and before huge audiences, both religious and nonreligious. He is responsible for bringing so many people closer to Hashem. Now his derashos are finally accessible in print to the English-speaking audience. In his unique, penetrating style—with stories and parables, lessons and maxims, pesukim and ma’amarei Chazal—he brings the weekly parashah alive. As you unearth this magnificent treasure of stories and real-life lessons, Rav Galinsky’s derashos will transform you and your Shabbos table.